Tarzan is a 1999 Academy Award-winning animated feature film produced by Walt Disney Feature Animation, and released by Walt Disney Pictures on June 18, 1999. The thirty-seventh film in the Disney animated features canon, it is based upon the Tarzan of the Apes series of novels by Edgar Rice Burroughs, and is the only major motion picture version of the Tarzan property to be animated. It is also the last "bona fide" hit before the Disney slump of the early 2000s making $171,091,819 in domestic gross and $448,191,819 worldwide, out grossing its predecessors Mulan and Hercules. 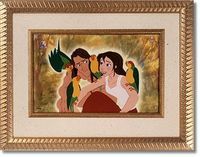 To date, it is the last film based on the fictional character Tarzan to have had a theatrical release, and also currently holds the record for being the most expensive Disney animated film, with a budget of $150 million.